If you are experiencing lower back pain, work on strengthening your hips, back, abdominals, and pelvic area, according to WebMD. The bicycle exercise will help target your abdominals. Lie on your back with your hands folded behind your head and your shoulders slightly off the ground. You can keep one foot on the floor while bringing the other leg’s knee in toward the opposite elbow. Then put that foot on the floor and alternate. You can go through the movements slow or a little bit quicker to get your heart rate up. The straight leg raise will help to strengthen your hips. Lie on your left side with your legs stacked.You can place your left hand behind your head and your right hand on the floor in front of you. Raise your right leg up and hold for a few seconds. Then, bring back to the starting position. Repeat for a total of 10 times. Next, switch sides and repeat. Practicing good posture when you sit and stand will also help with lower back pain. When lifting, be sure you are lifting with your knees and not your back. Try bent-over rows to help build your mid-back muscles to help alleviate pain. Hold a dumbbell in each hand. Stand with your feet hip-width apart. Bend your knees slightly and hinge forward at your hips. Make sure to keep your back flat. Bring both dumbbells up toward your breast bone making sure to keep your arms close to your ribs. Then, lower the dumbbells back down slowly. Try 2 sets of 10 repetitions. Incorporating these exercises for back pain into your daily routine may help. 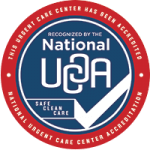 You can also visit Advanced Urgent Care & Occupational Medicine in Brighton, Northglenn, or Ft. Lupton to have your back pain evaluated today.